Liturgical weaving. 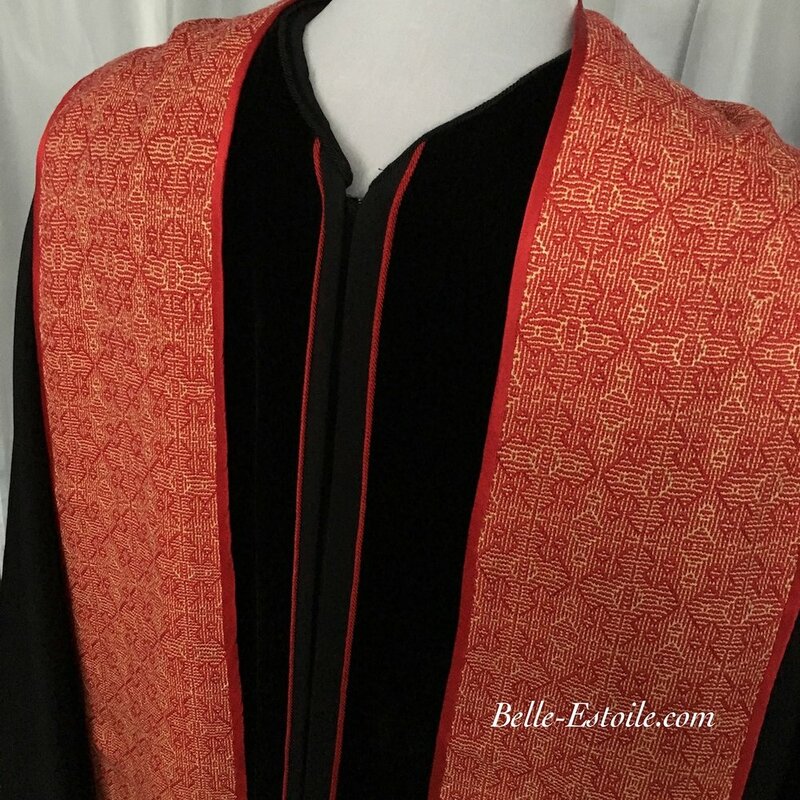 Handmade and hand woven clergy stoles, ministerial stoles, deacons stoles, vestments and paraments. From the earliest days of the Israelite Tabernacle, textiles have been an important part of worship, reflecting the care and devotion of the artisan, and enhancing the worship experience for the officiant and the congregation. Green to remember that our Shepherd will provide fresh pastures to nourish us and still, cool waters to refresh us. in preparation for His coming. 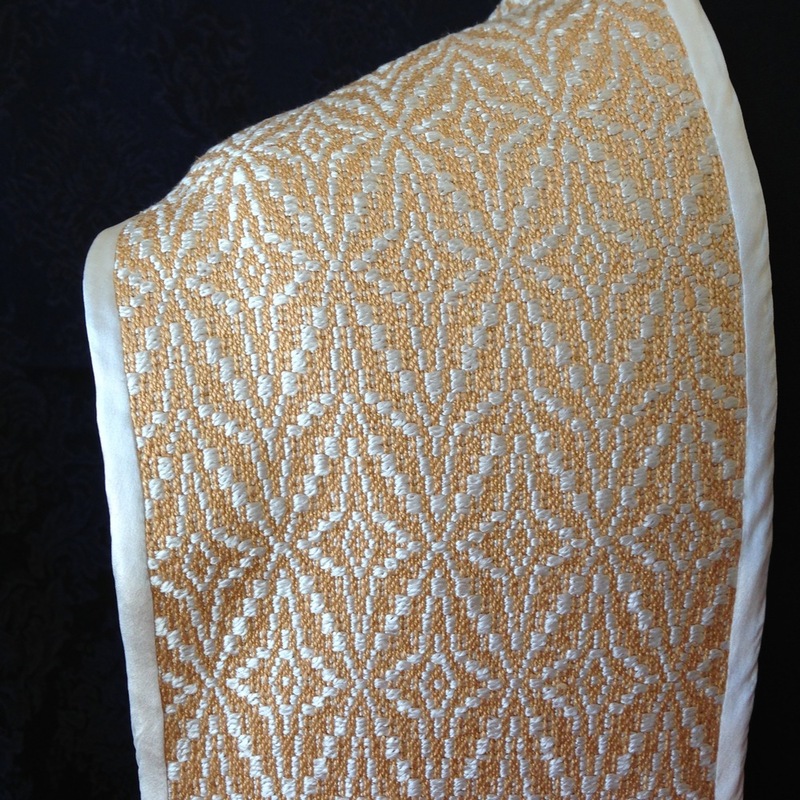 White silk on gold silk ground, lined and edged with white silk sateen. 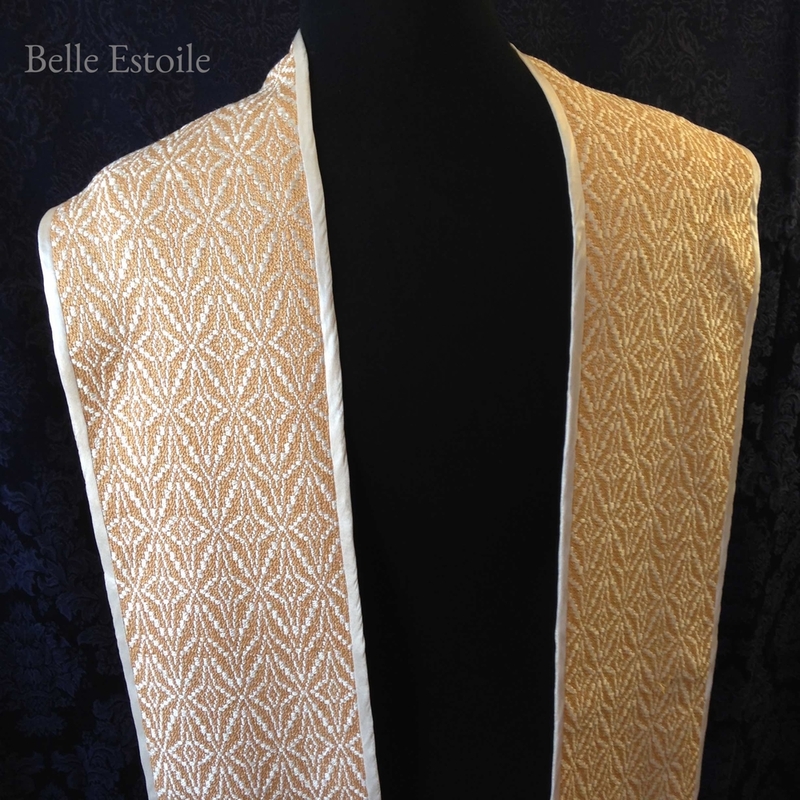 A distinctive and celebratory design, hand-dyed and handwoven silk. Available in white/gold, purple, red, green or white silk. Lining is dyed to match, silk/cotton blend sateen for comfortable wear. Standard woven length is 98” plus 2” fringe for an overall length of 102”; 6-1/2” wide. Different lengths available on request. At just under six ounces, it drapes comfortably around the neck. V-neck shaping available on request, as is shaping for diaconal stoles. Visit my shop to see what's available to ship, or to request a custom order. If you have questions about my designs or process, I would be happy to hear from you. Please feel fee to contact me. Celebrate diversity with pride in this Rainbow Stole woven in the Spirit Flame pattern. 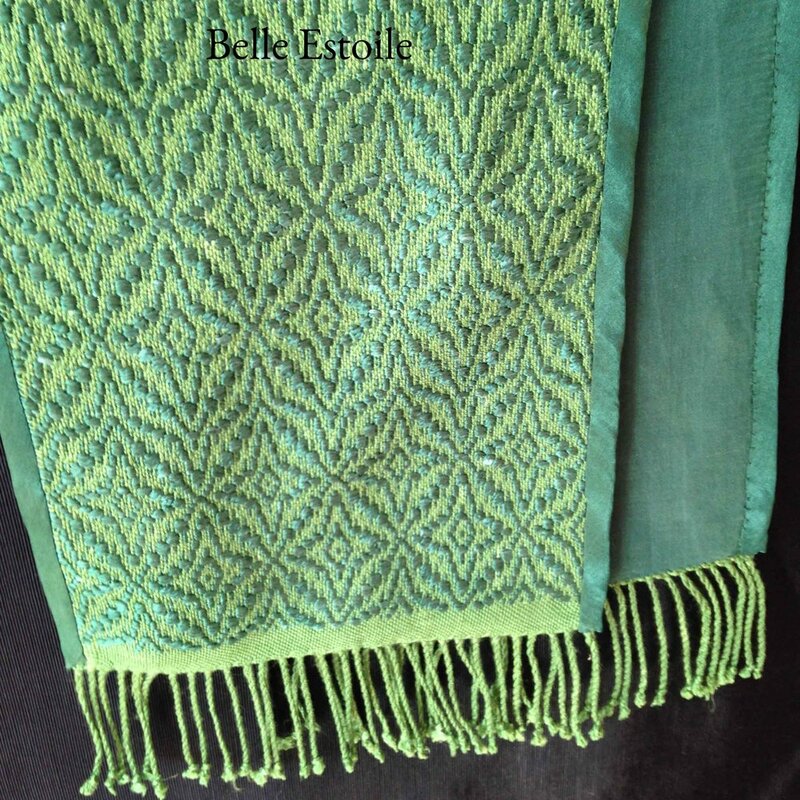 Hand dyed and handwoven Tencel, a plant based fiber from sustainably grown wood products. Lining is silk and cotton blend sateen, for comfortable wear. 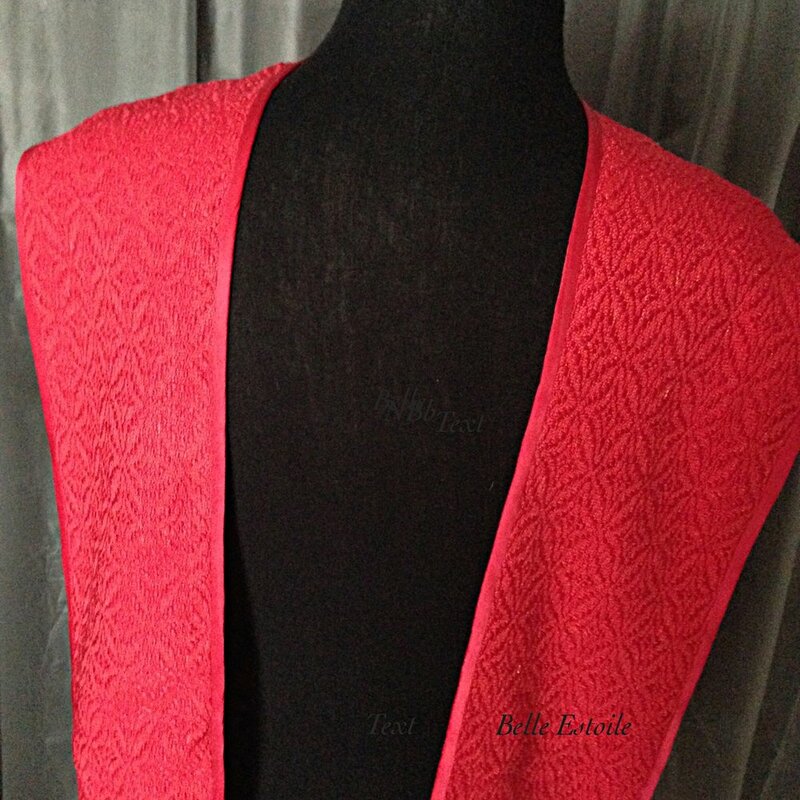 V-neck shaping in back. Can be worn across the shoulder and pinned or loosely knotted for diaconal wear (pin not included). Woven length is 115” plus 2” fringe at each end; inside neck edge from center back is 52-1/2" plus 2" fringe; 5-1/2” wide. 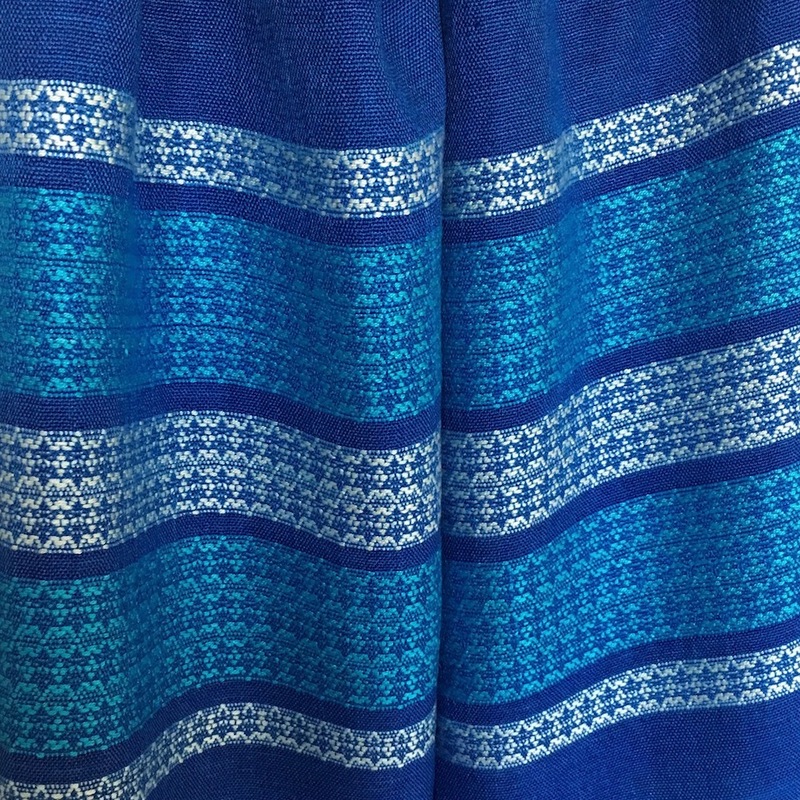 A traditional design, hand-dyed and handwoven silk. 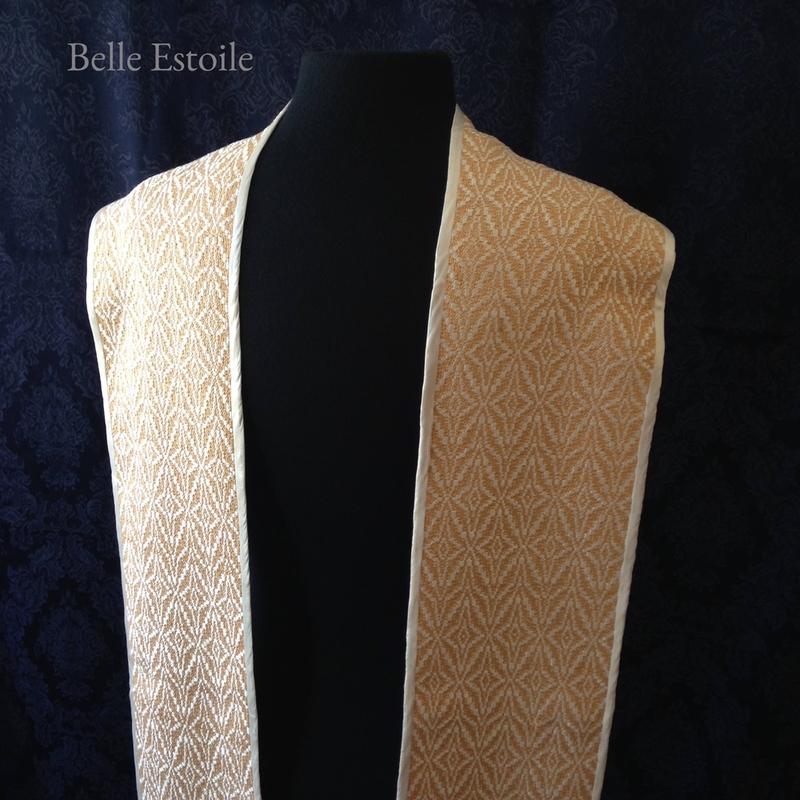 Available in green/gold, purple/gold, or red/gold silk. Lining is dyed to match, silk/cotton blend sateen for comfortable wear. Standard woven length is 98” plus 2” fringe for an overall length of 102”; 6” wide. Different lengths available on request. At just under six ounces, it drapes comfortably around the neck. V-neck shaping, available on request. 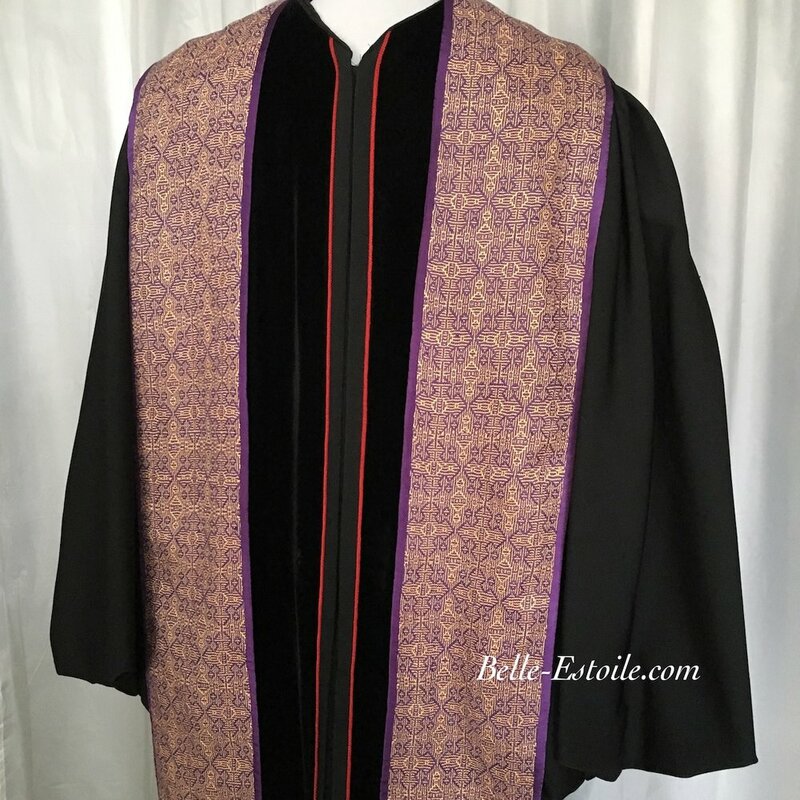 Deacon's stoles also available. It’s my privilege to be able to weave custom tallitot for Jewish worship celebration. I work with the client to design something that is personally meaningful, in alignment with Jewish custom. Tallit are custom orders, and require a minimum of 8 weeks for delivery. 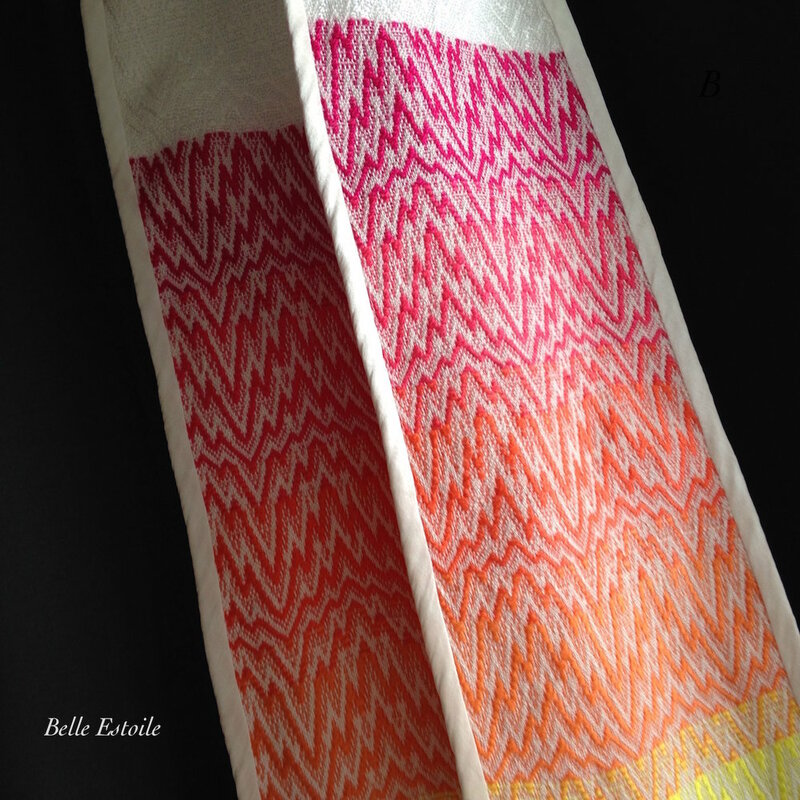 The examples below are made with Tencel, a cellulose fiber made from sustainably sourced wood and hand dyed. Handwoven tallit with a gradient stripe in Star of David pattern.